I am looking for a credible source for engine bearing failure analysis. Picture is attached for clarification purposes. 4. Any information on possible over-loading of engine, or timing issues? Engine was returned to us without oil and oil filter. We did manage to get a small amount of oil to analyze. Only showed high copper content. Don't know about loading. Timing is electronic from ECM 5.9L Cummins ISBe. Clevite bearing failure guide suggests oil starvation because of the shiny nature of the bearings and the heat discolouration. What do you think? 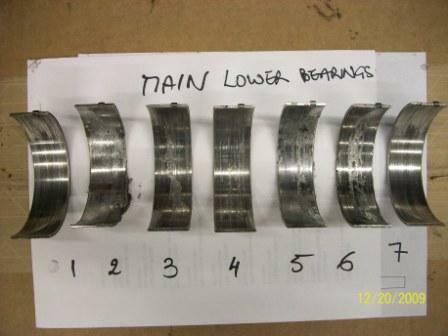 Interesting that the lower rod bearings have significantly more wear than upper. Any thoughts? Hi Perry, hence my interest in that over-loaded area. Oil film thickness has been breeched, and I have reservation (based upon the little information so far)that it was to do with oil viscosity (unless there was severe fuel dilution? ), so what is causing the extra loading - duty cycle, improper timing, lots of start/stops, what??? The bearing material looks to be ok metallurgically-wise, and I don't believe it to be oil starvation as there would be other information identifiable with that cause-effect. Sorry but that picture didn't come out that good. Could you see if you could have all the bearings shown the way they are but all in a line including main and big end bearings? That might show up a pattern, possible crankshaft bend or other....but the discolouration between upper and lower shells of big end bearings looks really odd, yes the lower should be worn more than the upper, but there are some really odd differences...what is the firing order 2-4-6, 1-3-5, ??? 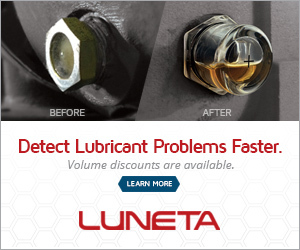 Cn you provid more detail, engine type, hours, oil analysis? ?